It's new (completed in 1998) and seats 1300. It is hexagonal in shape, and has a group of impressive stained-glass windows to the left of the sanctuary area. 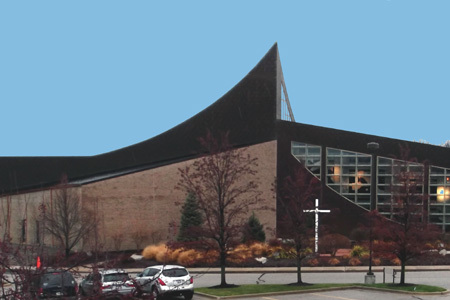 This is a parish of 2000 families, and has the usual mix of Christian education, social outreach, liturgical ministries, youth groups, and food and bereavement ministries. There is a strong music program (their choir is planning a 2012 tour of Ireland). They build a home each year for Habitat for Humanity, and have a twinning relationship with Our Lady's Nativity parish in Verrettes, Haiti. There are a lot of young adults with families in the parish, and the range of social activities is extensive, including softball, golf and bridge groups. Ada is a highly affluent township east of Grand Rapids, with a population of around 10,000. Only one per cent of its population lives below the poverty line. It is the home of the world headquarters of Amway, the direct marketer of health and beauty products. The area immediately around the church is highly residential, with a couple of other churches and a school nearby. The Revd Leonard Sudlik, pastor of the parish, was presider and homilist. M. DeYonker and B. Fisher were lectors. There were a dozen eucharistic ministers. Cantor and pianist were not named either in the bulletin or service leaflet. No. There are some seven entrances to the worship area, and ushers were to be found at only a couple of these. Service leaflets were at the end of each pew, for worshippers to pick up for themselves. Wooden but quite comfortable, with pull-down kneelers under the pews. Fairly quiet, which I found remarkable for a congregation of this size. The cantor began with "Good morning and welcome to St Robert's on this First Sunday of Advent." She then told us where we could find the order of mass, noting that we would be using the new translation of the Roman Missal. The aforementioned leaflet, which contained service music (Kyrie, responsorial psalm, Sanctus, etc. ), and some of the responses (preface dialogue and the invitation to communion); for other materials the leaflet gave page numbers to the missalette in the pews (Breaking Bread 2012, a publication of Oregon Catholic Press). A grand piano. The parish has a three-manual organ (not able to tell if a pipe organ or electronic instrument), but it was not used. The was also a drum set to the right of the sanctuary area, but it also was not used. The sheer size of the space. When, for example, the cantor went from her stand in the music area to the lectern to proclaim the responsorial psalm, it seemed like it took an eternity for her to get there. A formal liturgy, with nothing that I would consider happy-talk, but no excess of ceremonial, either. The music was entirely of the last 30 years or so, save for the final hymn ("O Come, O Come, Emmanuel"), which we sang a cappella. 9 – Father Sudlik is an accomplished public speaker. He spoke without notes, and not from a lectern or pulpit. Given the size of the space, he could hardly have walked among the congregation, but he did walk from side to side, attempting to establish contact with different parts of the congregation. He began by noting that just about the entire country knows that Roman Catholics in the United States will be using a new translation of the missal. He mentioned that St Robert's had introduced the new texts the previous week. He noted that the new translation had been undertaken for two reasons: to have an English text that more closely reflects the Latin of the Roman Missal, but also to recover scriptural references that have been lost. He then said that he wanted to look at four words in the Nicene Creed that had not been changed: "one, holy, Catholic, and apostolic." It was important for the church to preserve its unity, and thus for all language groups to pray with a text that says the same as the Latin original. The new texts emphasize the holiness and reverence of the mass. The parish had obviously been prepared for the new missal translation with care. They, along with other parishes in the diocese, have been using a new mass setting (Randall DeBruyn's Mass of Resurrection) since October rather than an old setting, which would have to be retooled with the new words. This is not a singing congregation. You would think that a congregation of over a thousand, in a fairly resonant space, would raise the roof. Not so, and I noticed a number of people around me who made no attempt to enter into the sung portions of the service. Nothing. But then, in a congregation of this size, I can't imagine how anyone would have recognized me as a visitor. 3 – I don't wish this to seem a criticism. What St Robert's is doing obviously works for a lot of folks. But I've never been a member of a parish even remotely as large as this, and I wouldn't have a clue as to how to go about it. And there was a bland sameness to all of the music chosen, save for the one traditional hymn. That a parish with a significant investment in an organ of some size would not use it. And the singing (or lack thereof).